Glacier Under Canvas is located 7 miles from the breathtaking Glacier National Park where peaks touch the sky, glaciers move the earth, waterfalls carve the rock, and wildlife roam as freely as they always have. Once you've spent your day experiencing the beauty and adventure of Glacier, you can return to our Luxury Tent Camp and unwind in style. Our luxurious accommodations offer you the opportunity to enjoy the wild without giving up the comforts of home. This is not camping as you know it. This is camping as it should be. 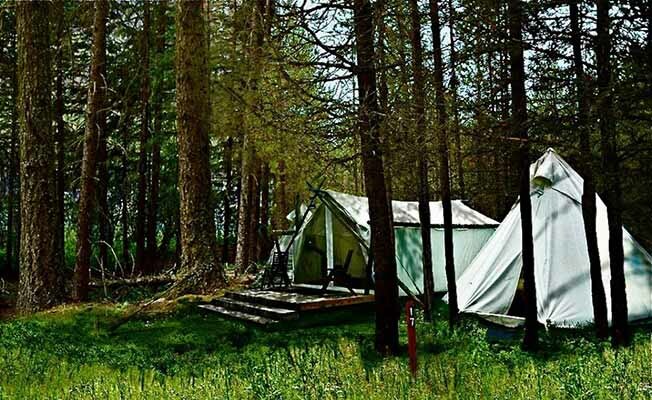 Luxury Camping, more recently known as "Glamping", is new on the scene in Glacier. Come and stay in a stunning Safari Tent or Tipi while enjoying amazing scenery, and comfortable luxury bathrooms, all just minutes from one of the Nation's most beautiful National Parks.